Other pools are available as well. Custom orders are welcome. 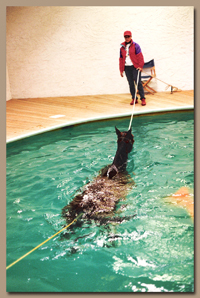 Recovery pools provide the safest and most effective recovery for horses and other animals that have has surgery under general anesthetic. The pool itself is nine feet deep (depending on the installation), with a non-skid coated metal grid that serves as the floor. This grid can be hydraulically lowered or raised as the horse recovers and regains control of its movements. The pool is heated and there are several water jets that provide gentle massaging of the horse during the recovery process. The horse itself only goes in up to its withers, still suspended from the sling and supported by its own buoyancy. Their head is fitted with flotation aids and there are at least five attendants present at all times. As the horse regains consciousness, the floor is then slowly raised and they can slowly begin to bear weight on their legs. 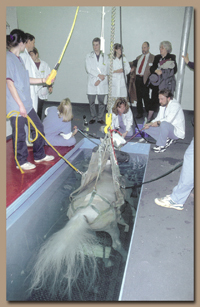 When the veterinarian deems that the horse is ready to leave, the grid is raised to the floor level and the horse can be transported – or walked – back to its stall. This represents the ultimate in safety for the recovering horse, especially in the case of severe leg injuries. Smaller versions of the recovery pool are also used for canine and other small animal recovery. Many animals thrash or kick when waking after surgery which can easily cause re-injuries. The recovery pool eliminates this by allowing the animals to gently awake in a controlled buoyant environment. 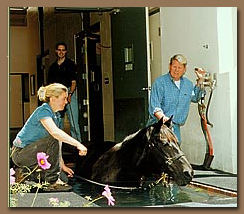 Recovery pools are now in use by premier Equine Rehabilitation centers such as Alamo Pintado Equine Medical Center and several others.